Download a blank fillable Dd Form 2859 - Foreign Activities Questionnaire in PDF format just by clicking the "DOWNLOAD PDF" button. Complete Dd Form 2859 - Foreign Activities Questionnaire with your personal data - all interactive fields are highlighted in places where you should type, access drop-down lists or select multiple-choice options. AUTHORITY: 5 U.S.C. 301; U.S. CONST. art. I, s9, cl. 8; 5 U.S.C. 7342.
authorized to accept foreign gifts and decorations from a foreign government. private sources for purposes of obtaining information relevant to a conflict of interest investigation or determination. committee; and (2) the employee, or family member, is not authorized to retain a foreign gift or decoration. governments. The restrictions are described below. 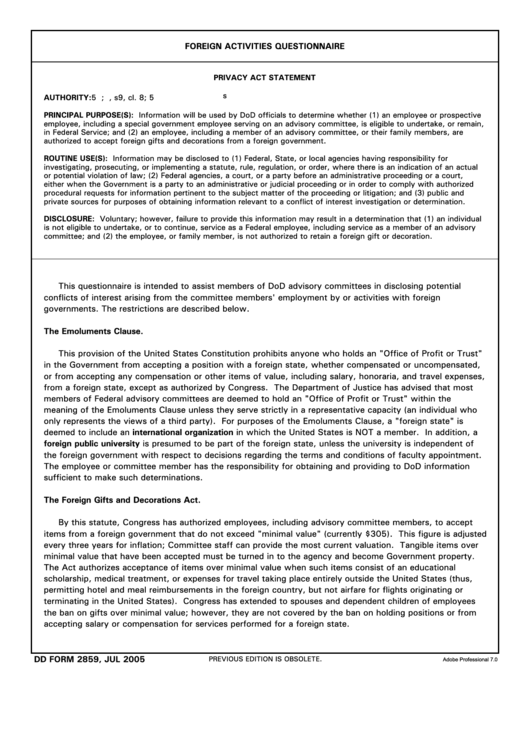 This provision of the United States Constitution prohibits anyone who holds an "Office of Profit or Trust"
the foreign government with respect to decisions regarding the terms and conditions of faculty appointment. sufficient to make such determinations. The Foreign Gifts and Decorations Act. minimal value that have been accepted must be turned in to the agency and become Government property. accepting salary or compensation for services performed for a foreign state.